This weekend I got a chance to attend my second meeting of the Pacific Northwest Tool Collectors group, this time as a member rather than a visitor. I had a list this time, and I got most of what I was looking for actually, and a couple of interesting pieces. 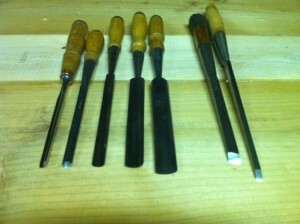 My main goal was to look for some chisels, specifically gouges and mortise chisels. I got a fairly decent selection shown here. I’m hoping to gather a selection of carving tools to do a variety of tasks, but eventually I’d like to try my hand at stuff like Peter does. that is a ways off, but I thought I’d start gathering a selection to start experimenting with. I paid an average of $12 each for them, which is a lot less than I can find similar tools new. I need to buy a V gouge though, that seems pretty integral, and I didn’t see any at this show. I also picked up a couple more mortise chisels. I now have 3. A random little find was this collection of gimlet auger bits I found for $5. Screw hole starters essentially, could be useful. My favorite find of the day was this Miller Falls #7 skew and rabbet block plane. 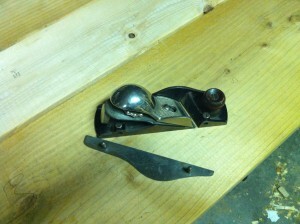 This is a copy of the Stanley #140 block plane, down to the removable side. There was a beat up #140 there at another table, but it got so many bids on it during the morning it went to the auction portion. The #140 planes are getting very hard to find, and the collectors are snapping them up. I was happy to find the Miller Falls version, in good shape for $65 (I talked him down from $75) instead. They aren’t as collectible which is fine by me, since I’m interested in “user” tools. While I was working on the work bench, I had a 2×4 that was a shade too long and the #7 made short work of that. Without even needing to be sharpened! I will spend a little time giving it a cleaning and sharpening later, but I was impressed with its utility right from the start. The next PNTC Meeting up in Seattle is not till November, but I look forward to it. One of these days I might find my way down to one of the Portland gatherings. I also sort of volunteered to help with web stuff, lets see if they take me up on it. Seriously, let me know if there’s anything specific you’re looking for. How about a nice simple Ogee molding plane? Sorry. Haven’t seen a lot of H&Rs or moulding planes around my neck of the woods. I think a lot of people equate them as being really valuable. But most of the ones I see are dogmeat by the time I get to them. You can scrub tarnish off an old cast iron plane, but once the wood on a moulding plane goes there’s nothing left but the iron, and sometimes that’s gone too. I’ve been thinking of buying some BORG moulding and gluing up some soles–you can then reverse-engineer a plane iron that will fit perfectly at your preferred/specified bedding angle, something I read about from Harry Strasil. It may sound really complicated but it would actually only be a series of steps. I think new moulding planes are an arm and a leg but if you or I was making a living making them, they’d have to cost a pretty penny in order to make the numbers worthwhile–a lot like new saws and planes. That MF#7 is a serious gloat though. I got the Veritas iteration, which is a machining miracle and includes an adjustable mouth, but yikes the price was jolly steep. That’s a very useful plane however. 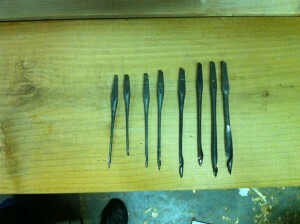 I’m not a tool dealer, but run across a lot of tools because I like to rust hunt. Picked up a nice 9 1/2 type block plane with adjustable mouth for $3 the other weekend. It’ll need some work but once it’s done it’ll go into my son’s toolbox. He’s 8. Together we fixed up a router plane I found for $5. He used it to make something too from the book Handy Dads.